I often have to get up in the middle of the night to have a pee. Hopefully this is because of the enormous glass of water I always drink before going to sleep not because I am prematurely geriatric and will shortly be in adult nappies. Anyway, getting up involves stumbling in the dark, contact lens-less and subsequently blind, naked and consequently vulnerable, down the corridor and into the bathroom where I turn on the light and hope that its sudden illumination doesn't wake Daniel up. I often wonder what might be lurking around the corner, what might be underfoot. After all, the YouTube video that scared me so much was of someone barefoot in a laundry accidentally treading on a FunnelWeb Spider. But when you need to pee these considerations become secondary. There's a gecko in the shower pretending to be a bunch of leaves. Still as the night, toes splayed, disguised as part of a bush. Which was not quite so effective against the green and white tiles of our shower. This called for the waking up of Daniel. "Whaa? Whaa? Whasthemadder?" he yelled blindly (neither of us having yet had our eyes lasered). 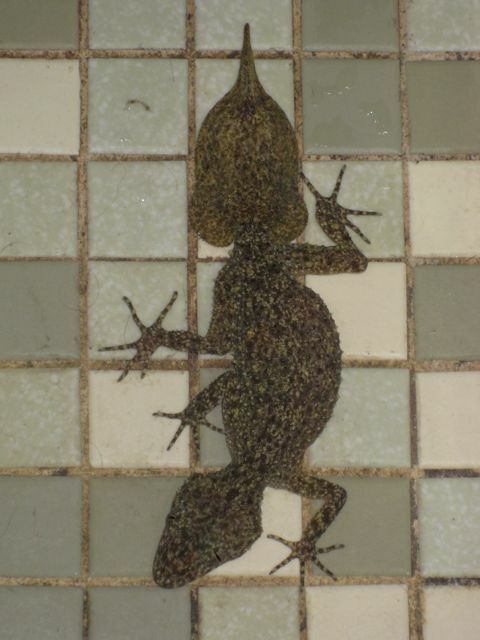 "There's a gecko in the shower" I said. And rather than roundly cursing me and going back to sleep, Daniel leaped up and came to have a look. This is the marvel that made me wake him up to come and see. It is a Southern Leaf-Tailed Gecko and they are, apparently, quite common in urban Sydney. It's beautiful mottled skin was scaly, covered in knobbly excrescences which mimic the lichen patterns upon which they spend most of their lives. Its tail was, as you can see, an extraordinary leaf-like shape, very flat with a tapered point. Unfortunately, it seemed a little out of sorts, unmoving and unblinking. We opened the bathroom window and shut the door and hoped that it would scuttle out in the night back to where it belonged. This morning it seemed to have gone. Until, that is, Daniel whipped the bath mat off the rail to have his shower only to discover our Leaf-Tailed Gecko clinging on to it for dear life. Clearly, it had to be rescued. Daniel went back to have his shower and I went outside a few minutes later at the raucous insistence of our cockatoos to distribute some sunflower seeds only to see the great black stalking presence of a Currawong viciously pecking at our Southern Leaf-Tailed Gecko in the grass. 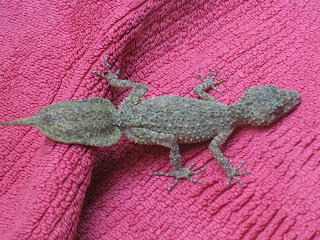 The lizard had managed to crawl off the bath mat into the relative safety of greenery but too late! It had been spotted. Before I could do anything useful the Currawong darted off with something wriggling in its mouth, writhing from side to side of the bird's sharply pointed beak. I yelled for Daniel who, for the second time in not too many hours, came running. "What? What?". I pointed to the Currawong in the tree and we both stood and stared horrified. 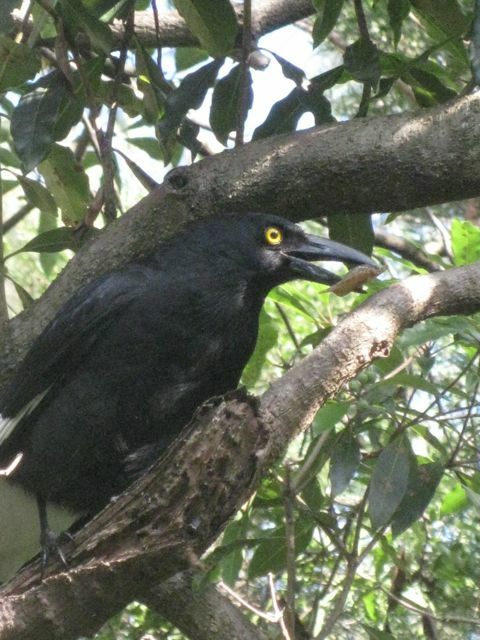 The Currawong had our beautiful Southern Leaf-Tailed Gecko's southern leaf-tail in its mouth. And the tail was still moving slowly from side to side, side to side. Down in the grass, our pecked Gecko was slowly crawling off into the undergrowth, bruised and battered, punctured and pained, tail-less, but alive. For, like some other wise lizards, these geckos shed their tails when being attacked. The bird sees the smaller moving tail and picks it up instead of the larger more problematical lizard. The Currawong seemed disappointed with its trophy however and attempted to go back for the kill so Daniel flicked the red bath mat at it like a matador annoying a bull whilst we waited for the gecko to crawl away. All this time the lizard's tail still flicked back and forth eerily in the bird's bill. Often people find these discarded tails in their gardens, still moving, and think they are a leaf-like animal in themselves...Our Southern Leaf-Tailed Gecko, if he survives his brutal attack, will grow another tail ere long. Nature, red in tooth and claw and not even breakfast yet. Rewind about twelve hours and I was walking in Blackman Park with Sniff. It was about 27 degrees, and the sun was bringing out all the basking skinks. Every step I took seemed to disturb some loafing lizard, usually Eastern Water Skinks which have a distinctive pale stripe down their sides. I'm blase about skinks now though. Bah, humbug to them I say. We reached the part of the walk where you have to cross a channel of the river by a small footbridge. Where the sun shines through overhanging trees and the water is gently rippling and dappled with light. I always stop and look down into the water to see if I can see any fish or perhaps, they are supposed to be there, an eel. 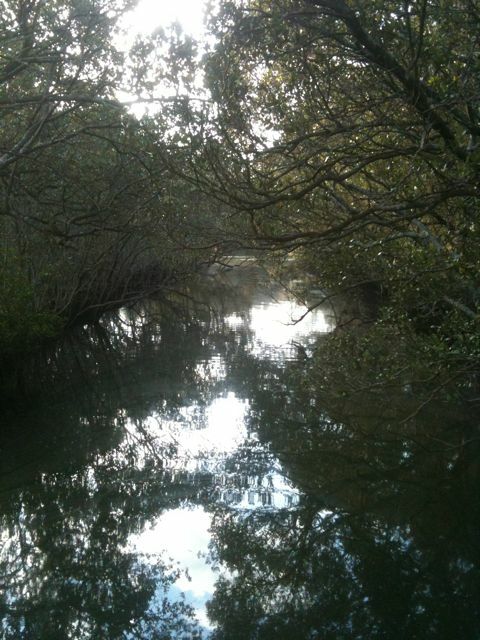 And I never really see anything except some tiny minnow-like shadows out of the corner of my eye. So imagine my delight when I spot a turtle. A bloody turtle. Gambolling away in the shallows, periodically rising for air, its extremely long neck extending and searching. 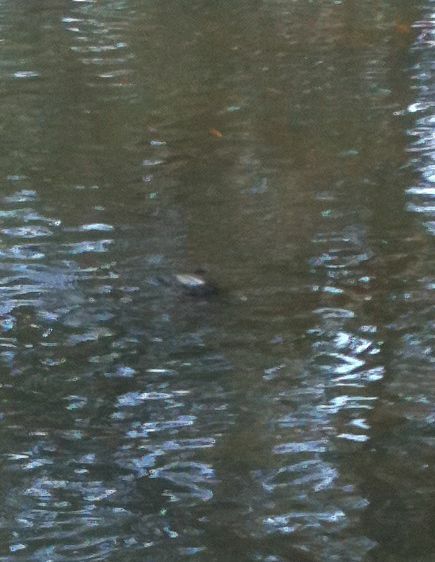 Casual, oblivious to my watching eye, a TURTLE! I watched the turtle meandering about, diving then surfacing, diving then surfacing, searching for food. I have since found out they can live for up to fifty years. Fifty years of bobbing up and down in the water. Eastern Snake-Necked turtles are also known as Stinkers because, instead of shedding their tail on captivity or when in danger, they emit a foul smell from the glands in their 'armpits' and groin that can be sprayed up to three feet to repel and disgust predators. So, all in all, it's a very good job that we found the Gecko in the bathroom and the Turtle in the river yesterday and not the other way around. Total Reptile Madness in less than 24 hours. That has to be something I Like About Sydney. very funny and also I am learning more and more about animal life in Sydney. ALl of which makes me less and less keen to visit, sorry. I am a wimp. Oh and..."my wretched I phone, which has no zoom"? Time to get a BlackBerry. much love from a woman stock piling salt and feeding her Christmas cake. PS feeding the cake brandy, you understand. Salt is for the seasonal weather conditions. Can't believe it is blog 38, it's been a brilliant way of passing the time, please never stop. When you come back, will you change it to "Things I miss about Sydney"? Or "Things I always hated about Sydney but didn't like to say in case they called me a wingeing pom"? or "Things I love more than ever about London now I am back"?